Not to be confused with Ashland/63rd (CTA station), also on the Green Line. Ashland (also Ashland/Lake) is an 'L' station on the CTA's Green and Pink Lines. It is an elevated station with two side platforms, located in Chicago's Near West Side neighborhood at 1601 West Lake Street. Just to the west of the station the Pink Line branches off from the Lake Street branch to follow the Paulina Connector to the Cermak branch. The adjacent stations are California (Green), which is located about 1 1⁄2 miles (2.4 km) to the west, Polk (Pink), which is located about 1 mile (1.6 km) to the south, and Morgan station, approximately 3⁄4 mile (1.2 km) to the east. Ashland Station opened on November 6, 1893 as part of the Lake Street Elevated Railroad's initial route, and it is one of the oldest standing stations on the 'L'. The station closed on April 4, 1948, along with nine other stations on the Lake Street branch, but later reopened on February 25, 1951, the same day the Milwaukee-Dearborn subway opened for service. During the two-year closure of the Green Line from 1994–1996, the station was restored and elevators were added to make the station ADA compliant. 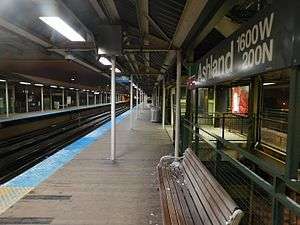 Ashland is the closest 'L' station to the United Center home of the Chicago Bulls NBA team and the Chicago Blackhawks NHL team. It is also directly adjacent to Union Park, venue for the Intonation Music Festival and the Pitchfork Music Festival. ↑ Due to possible double-counting of physically-connected stations, the CTA's official 2015 tally of stations was 146, but for ridership purposes reported having only 143 stations. ↑ "Monthly Ridership Report – December 2015" (PDF). Chicago Transit Authority Ridership Analysis and Reporting. January 11, 2016. Retrieved March 12, 2016. ↑ "Ashland". Chicago "L".org. Archived from the original on 14 October 2006. Retrieved September 28, 2006. ↑ "10 Stations Closed as CTA Speeds Up Lake St. Elevated". Chicago Daily Tribune. April 5, 1948. p. 4. ↑ "Loop 'L' Jams Will be Eased by New Subway". Chicago Daily Tribune. February 22, 1951. p. C11.